Much of modernity and even more of post-modernity is energized by the confrontation with the metaphysical abyss. Poetry has responded in myriad ways, ranging from a retreat into subjectivity to fragmented or intentionally nonsensical poetry that mirrors or enacts a world perceived as fragmented and nonsensical. 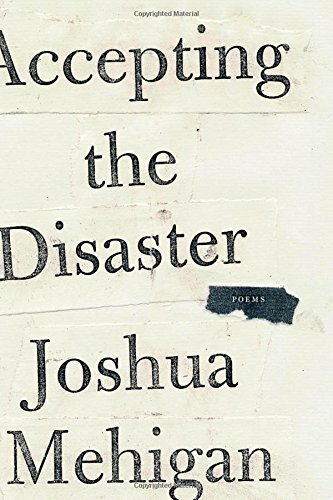 In Accepting the Disaster, Joshua Mehigan adopts a different approach. He writes extremely controlled poems whose discipline and understatement belie the depths of passion that inform them. He accepts the disaster; he describes the disaster. He does not join in it. to some failing of my own. but nothing, ever, anymore, for you. Mehigan’s world is harsh and uncomfortable, but it is also ours, stripped of cherished metaphysical consolations. Mehigan’s poetry expresses a common and rich worldview, and in Accepting the Disaster, he has done so elegantly, thoroughly, relentlessly, profoundly and beautifully. Accepting the Disaster is not a narrative, but it tells the story of post-industrial decay in a small city undoubtedly based on the town in upstate New York where Mehigan grew up. The opening poem, Here, establishes the setting as a place where “nothing . . . ever changes, till it does.” Although the lives of the townspeople seem both mirthless and pointless, change is not progress, unless it is the sort of progress that Walter Benjamin has evoked in describing a figure in a drawing by Paul Klee: "His face is turned toward the past. Where we perceive a chain of events, he sees one single catastrophe which keeps piling wreckage upon wreckage and hurls it in front of his feet. The angel would like to stay, awaken the dead, and make whole what has been smashed. But a storm is blowing from Paradise; it has got caught in his wings with such violence that the angel can no longer close them. The storm irresistibly propels him into the future to which his back is turned, while the pile of debris before him grows skyward. This storm is what we call progress." Mehigan’s book alternates between poignantly detailing the disaster of a post-industrial town and hinting at a broader cultural disaster. When he writes in the latter mode, as in the title poem, he writes in conversation with Benjamin. Because Mehigan recognizes the dark humor and absurdity in our experience of the disaster, Benjamin is Mehigan’s straight man. half the world ranked above world averages. Elsewhere, the disaster consists of very real but familiar concerns about mortgages, past-due notices, and sleep aids, or it lapses into surrealistic absurdity, as in “we spent our dotages / becoming ostriches and walruses.” But the poem’s real achievement is the elision of imagined catastrophe and everyday life. Seas rose, and threatened to deluge our lowlands and isthmuses. Our western forests turned to furnaces. Equinoctial dust stopped up our sinuses. and, each month, one or two more languages. Mehigan’s poem defamiliarizes his generation’s familiar disaster, but now and then he refamiliarizes and thus reshapes it. As Mehigan presents it, one generation experiences the disaster and reminisces about it in conversations with mocking children. But the disaster is also with us still, and while the signs of disaster pervade our daily lives, we are unprepared to do anything more than accept it. Other poems detail the town’s more local disaster. “The Smokestack” accretes meaning to the smokestack, which together with its church spire is one of the town’s main landmarks, through a litany of metaphors that are by turns arresting and comic in their extravagance and diversity. The smokestack may belong to another fixture of the town, commemorated in “The Cement Plant,” which provides an example of what change means in a town like this. The cement plant sustains the men of the town, while killing some of them and coating the rest and the town itself with its dust. In “Work Song,” we get a succinct description of the town’s culture of work: “We come. We carp. We’re fired. We worry later.” In “The Dream Job,” Mehigan illustrates how the monotony and tedium of work in the town bleeds over into the monotony of home life and even into dreams. A town where nothing ever changes might, despite its tedium, have its familiar comforts and consolations. But the cement plant closed down, leaving the workers with their worry, their dust, their bodies and relationships wrecked by their lives’ merciless drudgery, and very little else. They have no real prospects for future gainful employment or even pleasurable ways to pass the time. However else the town might have been experienced by its other inhabitants, the town that Mehigan describes is the one in which he grew up. Many of Mehigan’s poems in Accepting the Disaster describe places, and such descriptions serve as an introduction to the townspeople. As Mehigan puts it in his eerie and wise “The Sponge,” “minds and their milieus are all one thing.” Other poems, “The Crossroads” and “Down in the Valley,” describe mini-catastrophes, a car accident and (one supposes) a sexual assault, within the town’s more general disaster. The places resonate with the horrific events that they hosted. The book concludes with a lyrical poem, “Shark’s Tooth,” which is written in a different key from the rest. The speaker in the poem has found a shark’s tooth on a sandy beach. The shark’s tooth seems like a prize, like something the speaker searched for and found. He attempts to re-create the conditions that led him to the shark tooth so that he can find another, but at the same time he holds on to his shark tooth “like a sort of charm, / a talisman to ward off superstition.” But the speaker’s attachment to the shark tooth is itself a superstition. He contemplates the object as it sits in his palm and asks, “Was it an omen?” The poem never resolves the mystery of the shark tooth’s allure, concluding that it is “like a gift, or like bait,” held out to the speaker. The poem, with its lush descriptions of beachfront serenity and inscrutable skies, seems, for Mehigan, uncharacteristically hopeful. But as the last line suggests, Mehigan is ambivalent about hope. Mehigan’s second book was ten years in the making. Each poem evidences his craftsmanship. There are no false notes; no mistakes in word choice; no metrical infelicities. Mehigan is a master artist working at the height of his power. Fittingly, given Mehigan’s dour Weltanschauung, he realizes his gifts in an era when the world, even the world of poetry, is largely indifferent to the type of art that he has mastered. Already reviewers are predicting that his poems will make their way into anthologies and so on to posterity. I hope that they are right. But while Mehigan’s admirers agree that Mehigan’s poems are irreproachable, many readers will find them unapproachable. Mehigan hides his genius behind plain language and unpretentious subject matters. Mehigan writes with such facility in traditional forms that his poems do not call attention to themselves as adhering to a tradition. His mastery of form is so advanced that he can often disguise even the most familiar forms and compose in strict meters that will escape the notice of the casual reader, who will as a result be deaf to Mehigan’s music. Because there are so few contemporary readers of poetry, and because those few readers often have not been taught to appreciate formal poetry (and are sometimes taught that formal poetry is antiquated or conservative), Mehigan writes for a small, if highly appreciative audience. His poems will not attract readers for their subject matter, for their explorations of the poet’s interiority, ethnicity, sexuality, hardships, addictions, romances or break-ups. Nor do Mehigan’s poems have a clear political valence. If a reader is not impressed by Mehigan’s formal virtuosity, she might be put off by his poems’ austerity, their insistent gloom, and their resignation in the face of collapse. Mehigan’s poems will only be read because nothing better will be written, ever, anymore, for us. Let us hope that is reason enough. D.A. Jeremy Telman is associate dean for faculty development and professor of law at the Valparaiso University Law School and the editor of theContractsProf Blog, to which he contributes, among other things, limericks that summarize cases that he covers in his courses on contracts and business organizations. His scholarly writings have appeared in Austrian, French, German, Indian, Israeli, South African and U.S. publications.